Will I qualify for the solar rebate? For the 2018 solar rebate, you must be a Duke Energy Carolinas or Duke Energy Progress customer living in North Carolina. 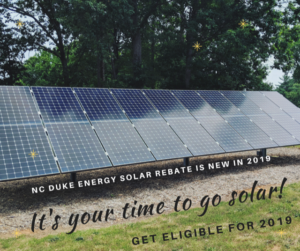 The Duke Energy Carolinas and Duke Energy Progress solar rebate requires that your bidirectional meter either be installed in the same year, or in the last 90 days of the previous year. For the the 2019 program year you can begin work on your solar installation after October 3, 2018, to be eligible to apply for the 2019 rebate. This is to abide by the 90-Day Rule intended to allow customers who install late in the year to still have a chance at the rebate. Because rebates are considered in the order received, it can be beneficial to avoid delays that could hold up your project, so that on January 1, 2019 you’re qualified and ready to apply for the rebate. July 9th is when the rebate program to open, and applications will be processed first-come-first-serve. Check back for updates and contact a solar contractor to get your installation lined up now! Want to read more about how the rebate program is designed? Check out this informative blog post.